Winner announcement: Monday evening, 6 December on BBC Wales radio, online and television, with review of the sporting year at later date. This year Jazz Carlin became the first Welshwoman for 36 years to win a Commonwealth Games swimming medal. The 20-year-old took silver in the women's 200m freestyle behind Australia's Kylie Palmer in the Dr SP Mukherjee Swimming Stadium. It was Team Wales' first medal of the Delhi Games and set a new Welsh record of one minute 58.29 seconds. Carling then followed that by taking bronze in the 400m, adding to Welsh swimming's Commonwealth Games medal haul that had been stagnant since Pat Beavan's efforts in 1974. 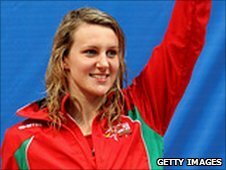 Born in Swindon but with Welsh heritage on both sides of her family, Carlin came 'home' to Swansea when she was 16 and trains at the Wales National Pool in the city. It was at that venue in February that Carlin revealed the great form she was in, as Great Britain beat Germany 207-109 in the 'Duel in the Pool'. The woman nicknamed 'Pitbull' by her American coach, Bud McCallister, beat British rival Jo Jackson - the world silver medallist - in the 200m freestyle final, having already beaten Olympic champion Rebecca Adlington in the 400m. There was disappointment in August at the European Championships in Budapest, Hungary, as Carlin just missed out on the final of the 400m, but together with Adlington, Hannah Miley and Jackson helped Great Britain win the 4x200m freestyle relay bronze behind Hungary and France.